Fillings…Whether you need an existing filling replaced or a new cavity filled, get the facts on what your options are. Gone are the days when cast gold and silver amalgams were your only choices. 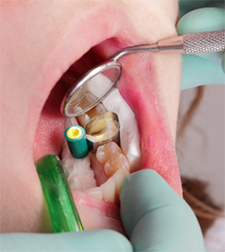 With dental care advancements, other materials are also being used to fill cavities. Here are the advantages and disadvantages of the four most common filling materials. 1. Silver Amalgam Fillings: Dental amalgam has been used to fill cavities for more than 150 years. Also known as “silver fillings”, it contains a mixture of metals ‚Äî consisting of liquid mercury and a powdered alloy. Amalgam fillings have proved the test of time due to their durability, strength and affordability. Silver fillings will last at least 10 years and can withstand chewing forces.